Australia rugby legends Stirling Mortlock and George Smith have been awarded the Member of the Order of Australia (AM) in the Australian Day honours. The pair of former Wallabies have been an integral part of Australian rugby over the past decade and their dedication has been recognised with Mortlock earning his honour for 'Services to the sport of rugby union football, particularly as captain of the Wallabies'. 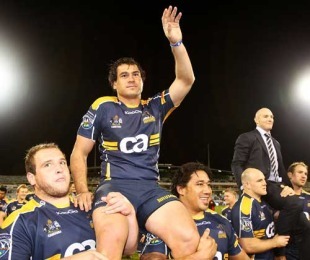 The pair both played at the Brumbies and Smith currently holds the honour of being the Wallabies' most-capped forward on 110. Mortlock has 80 caps to his name and has crossed the line 29 times for the Australians. And upon hearing of his award, Mortlock immediately paid tribute to his former team-mate Smith. "It's just great to get this honour alongside of him," Mortlock said. "Georgey was possibly a once-in-a-generation style of player. "He just did things that no one else was capable of doing, and his consistency to perform at the highest level week-in week-out and year-in year-out was absolutely phenomenal. "He was a freak of a player and thankfully I pretty much always played with him." And the Australian Rugby Union CEO John O'Neill paid tribute to the duo saying: "Both George and Stirling are more than deserving of this recognition with their appointments as Members of the Order of Australia. "Over a long period of time they have both served rugby at a State and National level as captains and have been good role models to both junior and senior players as well as contributing in the community. "Since joining the Melbourne Rebels in 2010 Stirling has shown great leadership both on and off the field helping to guide Australia's newest Super Rugby side through its first season as well as helping grow the game throughout Victoria. While George has played overseas for the past two years he has always kept an eye on what is happening in Australia and continues to lend a helping hand when needed. "The most recent example was during last year's devastating Queensland Floods when George, of his own accord, put together an amazing money can't buy experience to help raise funds for the Premier's Flood Appeal."